President Trump will be at the opening of the Mississippi Civil Rights Museum on Saturday, so led by Rep. Lewis (D-GA) Some civil rights leaders are refusing to attend Civil Rights Leaders are exercising their right of free association to express their feelings about the President of the United States. Enjoy the irony. Also know that, if Trump had not planned to attend the opening of the museum, these civil rights leaders would be condemning the President for that decision. U.S. Reps. John Lewis and Bennie Thompson will stay away from Saturday’s opening of the Mississippi Civil Rights Museum, citing the attendance of President Donald Trump. Lewis and Thompson, both Democratic leaders, had planned to attend Saturday. “The president hopes others will join him in recognizing that the movement was about removing barriers and unifying Americans of all backgrounds,” she said according to a press pool report. Rep. Lewis has a history of attacking Trump, the most famous of which occurred about a year ago when Lewis questioned whether Trump was a “legitimate president” and boycotted Trump’s inauguration. 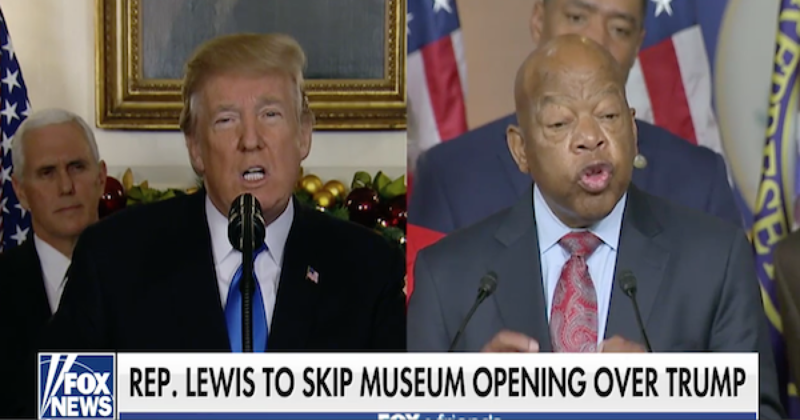 By skipping the Mississippi Civil Rights Museum opening Rep. Lewis continues his trend of acting like a spoiled child began when he skipped the inauguration.